Celebrate card details on the Elizabeth Craft Designs blog HERE! Happy New Year's Eve, my artlets! I tend to look ahead (in a panic!) a lot of the time. My life is filled with deadlines, both real - and imagined! But it's been quite the year here at Quietfire Design and well worth a look back. The Quietfire Design Team has shared a huge number of creations with you, both here on Quietfire Creations (219 posts!) and on their own blogs. We had a few talented guest designers share their special touches. 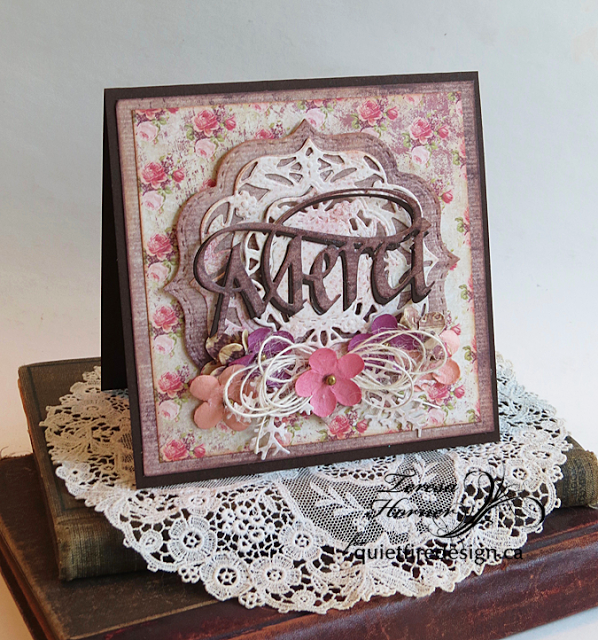 Many of the Elizabeth Craft Design designers have showcased the A Way With Words dies as well. I can't tell you how much I appreciate their wonderful creativity and the variety of ways they find to use Quietfire products! To see most of these amazing projects, scroll through our Pinterest boards! 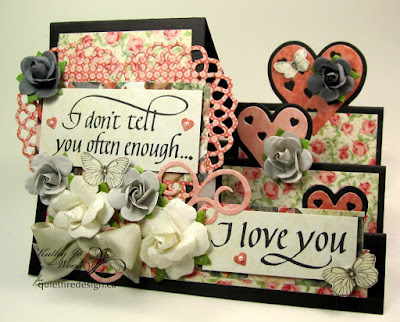 You can start with this one for rubber stamped artwork and this one for A Way With Words projects. I started the year out at the Craft and Hobby Association conference in Anaheim and for the first time was wearing an exhibitor id. 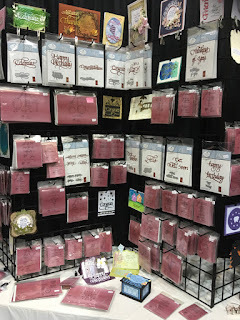 I spent most of my time at the Elizabeth Craft Designs booth learning so much that my brain was almost numb. It was my pleasure to get to know Els and family and Susan Tierney-Cockburn and Karen Burniston. Els had released 29 products for me this year bringing the total of A Way With Words collection to 41 (shhh, more coming very soon. So excited!!) For a quick overview, watch these little videos! 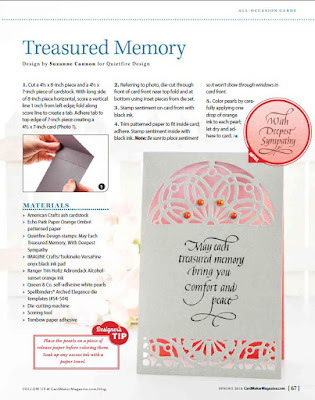 I was honoured to be published in most issues of CardMaker Magazine this year! Many thanks to CardMaker editor Tanya Fox for liking what I do! It's always a thrill to open up and issue and see what's in there! Which brings me to the designer of the die I used for the above Treasured Memory project above. And that is the incomparable Becca Feeken. Becca is a magician with paper. If you're not familiar with her, it's time to visit her website for a treat you'll never forget. It's hard to pick a favourite card! I have created a Pinterest board dedicated to her Quietfire projects HERE. I am so lucky she likes using my stamps! In April, we published A Way With Words Cards and More ebook! I learned a lot! 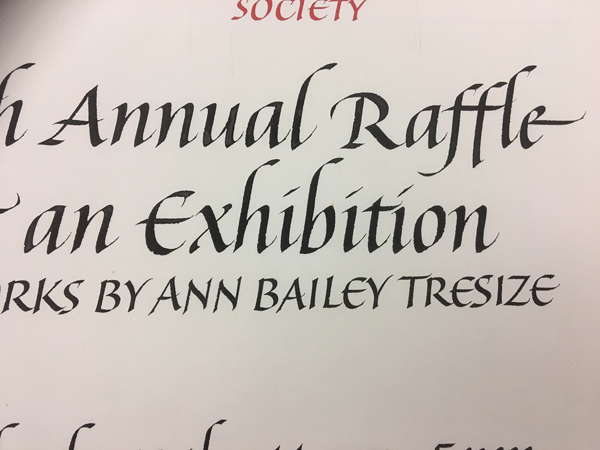 Special thanks to Elizabeth Craft Design for publishing our projects and Judi Kauffman for her invaluable assistance and eagle eye. I started in January thinking I could have this polished off in a month.... As I said, I learned a lot! 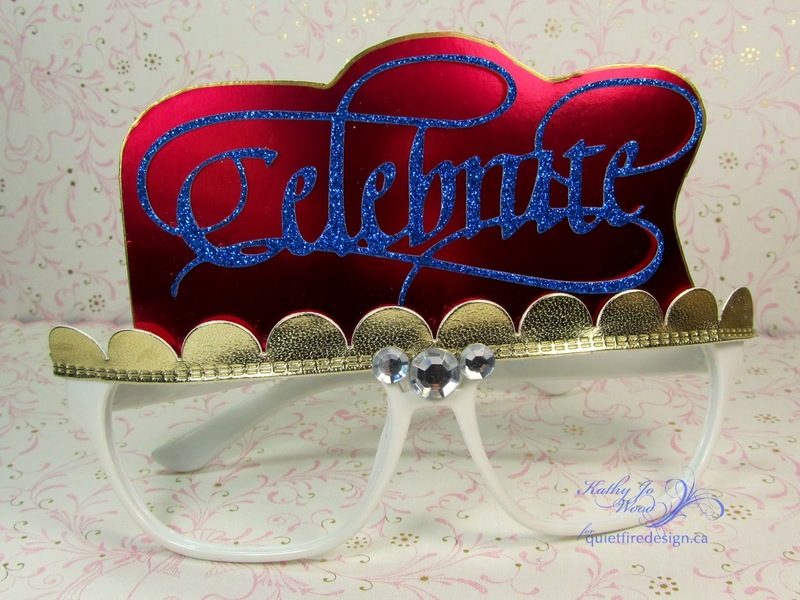 This year I am celebrating over 500 designs in the Silhouette Online Design store! Wow, how did that happen?! I think there must be something for every occasion and more. You'll find lettering, both formal and modern, boxes, cards and more. It's an ongoing struggle with Illustrator to create these files, but that anguish has eased with the purchase of a new computer in August! I fought a valiant battle - thinking it was my fault and I just wasn't digitally inclined - and then about 6 weeks after my purchase, things started falling into place. Whew. I'm sure my blood pressure has taken a big drop! In May, I started the Quietfire Digital blog, which is slowly gaining momentum. If you'd like to be a guest designer on it, send me an email with your project (and a link to your blog if you have one!)! 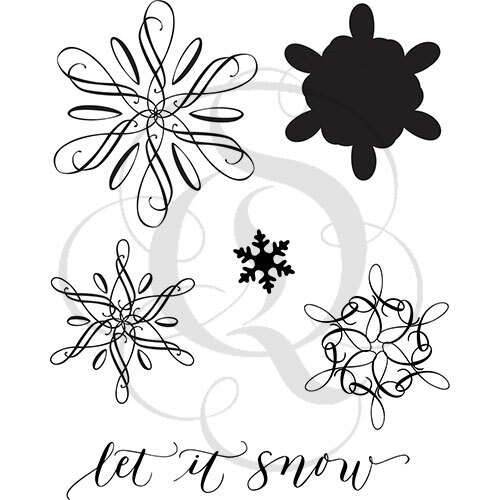 I have a limited number of designs in svg format on the Quietfire site HERE which are usable in most electronic cutting machines, but if you see something that is only available on the Silhouette Design store that you'd love as an svg, let me know! A huge thanks to Silhouette America for inviting me to their 2016 Summit in Honolulu. I was in tears when I got the invitation! They introduced all their new products at the Summit (which I am slowly acquiring and experimenting with), hosted us in rooms in the Sheraton Waikiki overlooking the beach and ocean, and treated us to a sightseeing day and a dinner cruise. I was numb in disbelief. So honoured! It was my pleasure to meet a number of the other amazing designers at the various events. We are all so different! And it's not because of this, but I have to say I am constantly reminded what an amazing tool the Silhouette Cameo is. 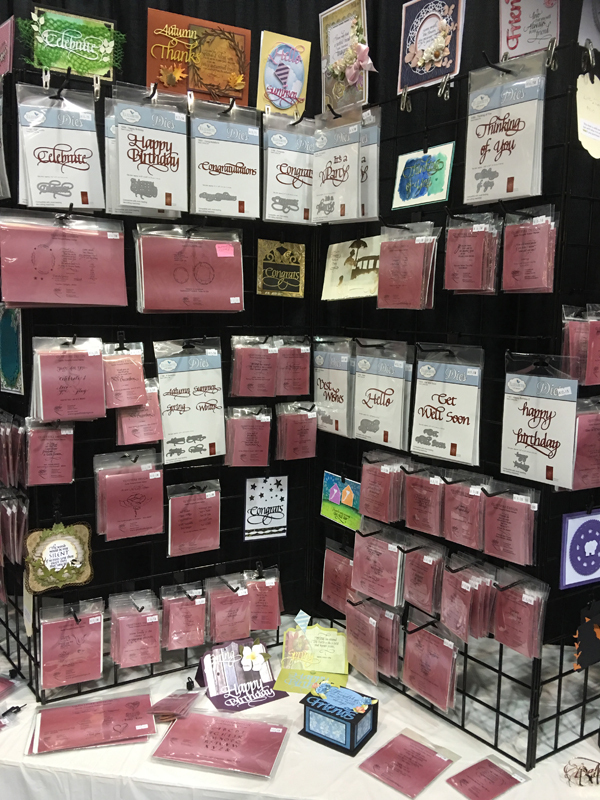 In September, I headed off to Edmonton, Alberta for the Great Canadian Scrapbook Festival, hosted by Creative Scrapbooker Magazine. It was a great time! And I didn't even get too nervous when I had to teach Make n' Takes. 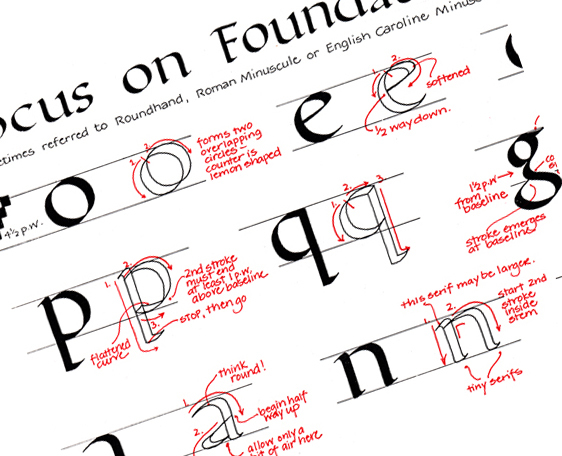 I'm much more comfortable teaching day-long calligraphy and bookbinding workshops than short projects! Thanks to everyone who came to shop or to visit in person! A special thanks to my friend Susan, whose tables, chairs and amazing talent for organization has made the event "doable" the last two years. She also stores my display racks! I'm so lucky to work with someone who is on the same wavelength!I had another first there: my first Facebook Live broadcast! 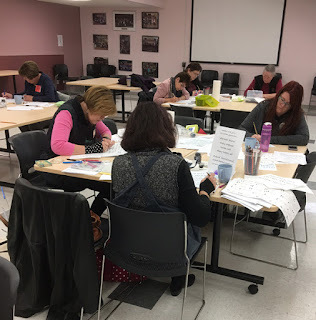 In November, I put on my calligrapher's cap and went to Red Deer, Alberta to teach Foundational for the Lettering Arts Guild. I enjoyed every minute. What a wonderful group - it always has been - welcoming me for the first time over 15 years ago! (Gosh, how time files!) Sending a special shout out to Roxanne, my hostess, for sharing her time, space and family with me! Are you still with me? Almost done! I changed caps to my bookbinding cap and spent a delightful day in November on Gabriola Island, located just off Nanaimo. We folded, pierced and punched! We had to punch holes on the floor because the tables had too much bounce! Awesome books! Awesome group! Unfortunately, the year ended on a sad note. 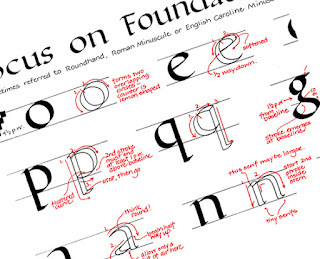 Fred Salmon, my calligraphy tutor, passed away. He was 94. I really don't even know where to start or where to end when describing him. He was a truly amazing person. Fred will always be sitting on my shoulder saying "I don't know about that, Suzanne...." even though he hasn't critiqued my work for many years. When I attended his celebration of life a few weeks ago there were many fine examples of his finished artwork, but this camera ready artwork for a poster was the piece that undid me. I hope you, too, have had many fine events this year. I hope you take a moment to jot them down! I didn't realize how amazing a year it has been until I kept adding wonderful things to this blog post! Thank you for coming along on this ride with me! There are some fun things in store for 2017 (some coming very soon!) and I hope you'll continue to enjoy what the Design Team and I have to offer. The Quietfire Design Team is the BEST! They've experienced passings and weddings, poor health and renovations in 2016, and through it all they continue to create such beauty. Here are a very few of their creations which stood out to me when I was scrolling back through the blog! Hello Crafty Friends! Kathy Jo here to share a glimmery holiday project. 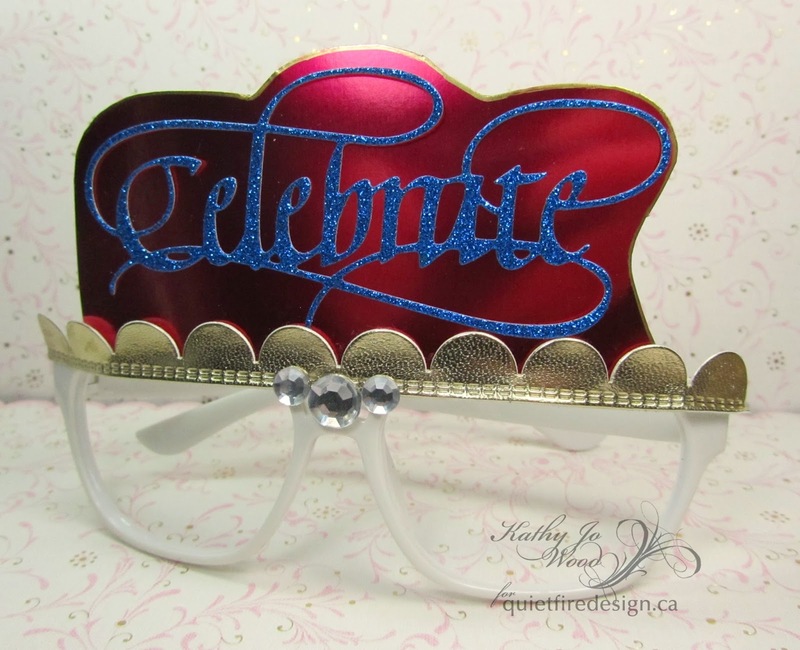 Yes, New Year's Eve is only a couple of days away and it is a perfect excuse to celebrate the evening with some bright, fun and easy to make eye wear. The white sunglasses were purchased at a local dollar store. (The lens were popped out for my project but you could easily leave them in.) 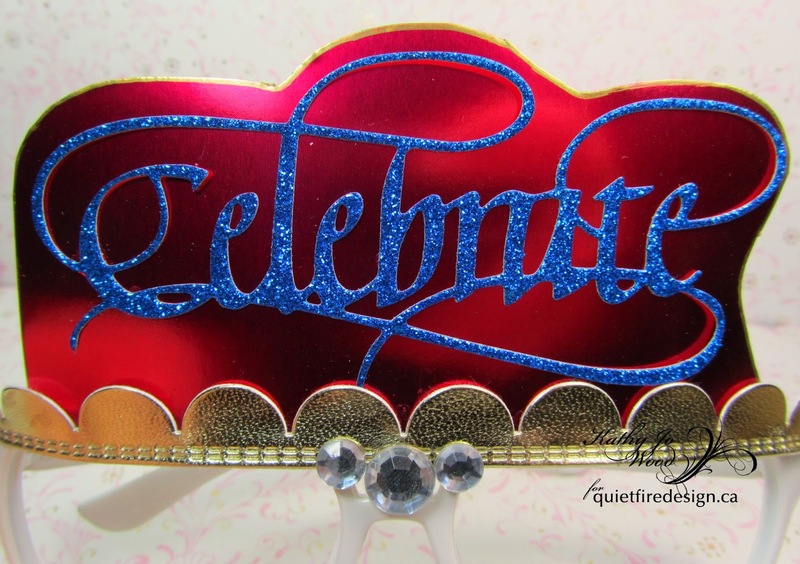 Celebrate was used to die cut royal blue glitter paper. Next, the die was placed back side down on thick metallic pink paper. (Place the die with the bottom near a straight edge.) The outline of the die was traced onto the paper- except the bottom of the die. 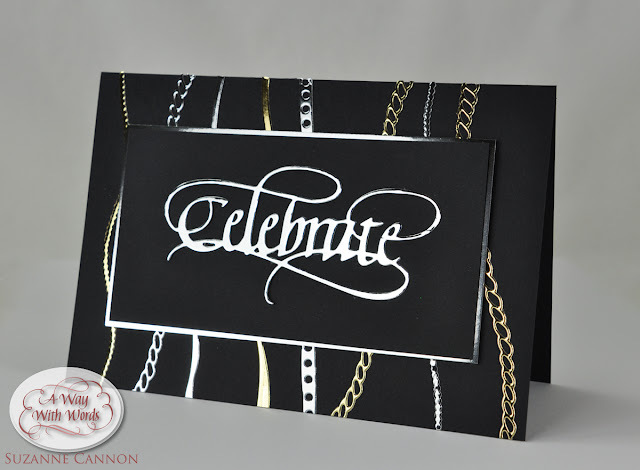 The metallic paper was cut as shown, gold marker applied along the cut edges and Celebrate was glued to the paper. The dried Celebrate assembly was then glued onto the top of the glasses using strong liquid adhesive. Gold "ribbon" border was adhered along the top of the glasses and three big, blingy gems were adhered to the center as shown. Oh yeah...you would be so styling in those glasses! Thanks for stopping by! I do hope you enjoyed this happy little project and I wish you nothing but the best in 2017! Hi everyone... I hope that you all had a wonderful holiday with your family and friends for Christmas and I hope you have lots of memories to scrap in the days ahead... I am really looking forward to spending some relaxing time in the coming weeks ahead and can't wait to get crafty again for 2017. 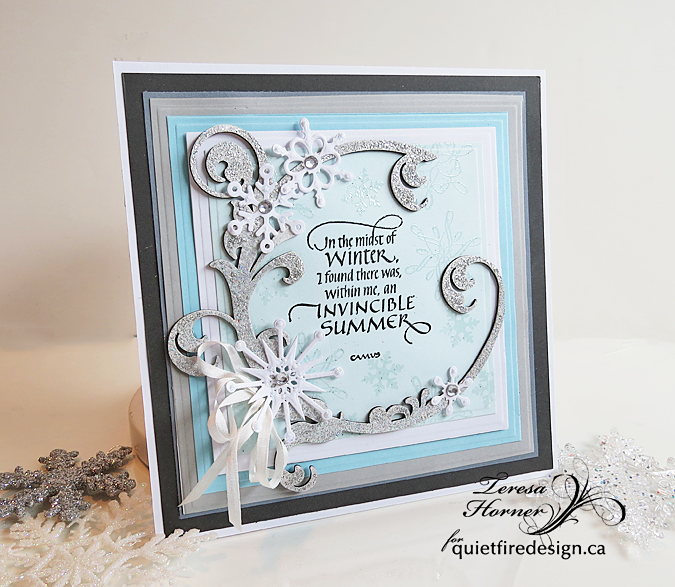 Today I have a fun easel back project that i made with the new stamp "In the Midst of Winter". It's one of my favorites because there are 3 other stamps that go with it in the series for all the other seasons so you could make a really pretty one with each stamp and set it out to decorate your house. How pretty would that be to do? This one i did with shades of aqua, white, grey and dark charcoal. The chippy die is from Gypsy Soul Laser Cuts. I thought it had the perfect shape to surround my stamped image and then add pretty snowflakes to set the scene. "Let it Snow flurried snowflakes" stamp set. 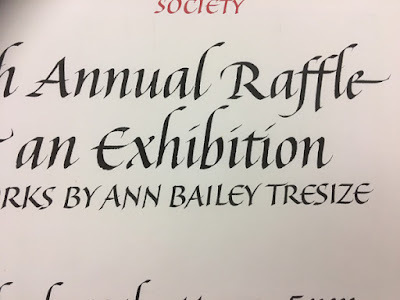 I used a versa mark ink and embossed them with clear so that i would get just a subtle image on the back round and it wouldn't compete too much with the title stamp. I love it so much i might even get a frame for it. Here is the picture of the stamps... They are so pretty and there is so many designs that you can pick from to use on all kinds of projects. and a safe and creative 2017 filled with new adventures. Thank you so much for following me. It is beginning to look a lot like Christmas! The snow is falling, the tree is decorated and everything in my home is ready for the holidays. For this Christmas card, I used the It's Beginning To Look a Lot Like Christmas rubber stamp. 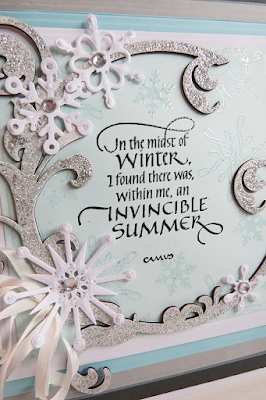 It was silver embossed on white card stock then die cut using one of the Elizabeth Craft Designs Stitched Ovals. 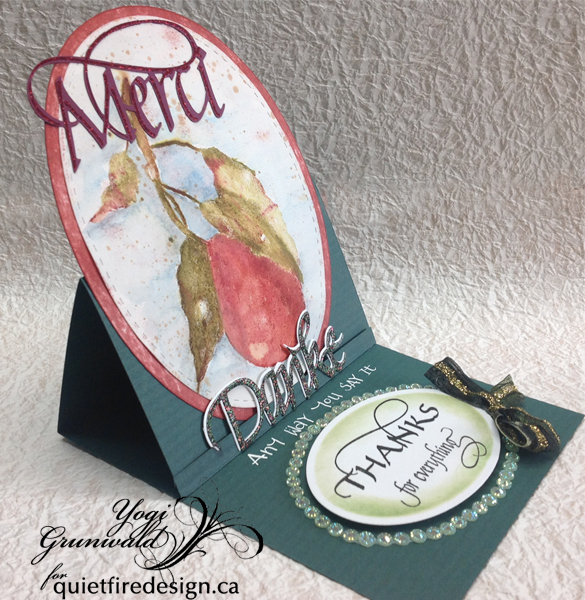 To make the card fun, I used the ECD Circle Background die to create a Shaker Card. The background was die cut three times and glued together to give the shaker some depth. 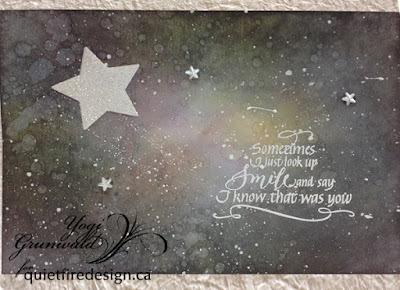 A piece of acetate was attached between the top and second layer of the background to hold the silver confetti. Once the confetti was added to each of the circles, a piece of card stock was added to cover the back. 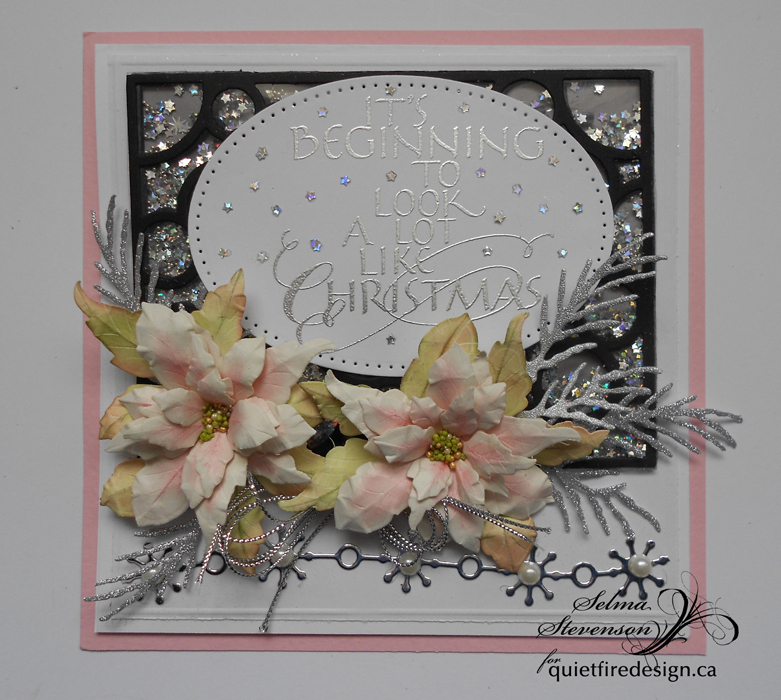 Pink and white poinsettias were created with Garden Notes Poinsettia dies. Whitepine boughs were die cut using white card stock with Clear Double Sided Adhesive on top, then they were covered with Silk Microfine Glitter, to correspond with the silver confetti. Along the bottom of the card, a silver snowflake Holiday Garland was added. Pearls were attached to the center of each snowflake. 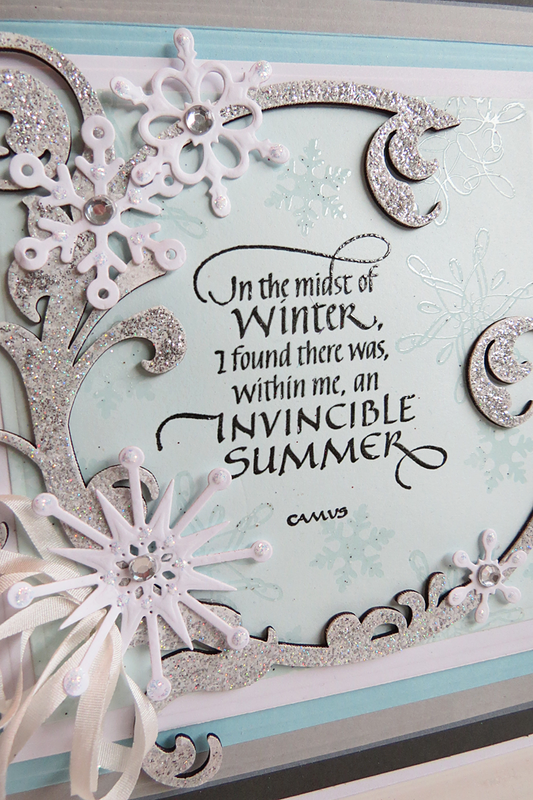 To finish the card, pieces of the confetti were glued around the embossed sentiment, and a thin silver corded ribbon was attached under the poinsettia. 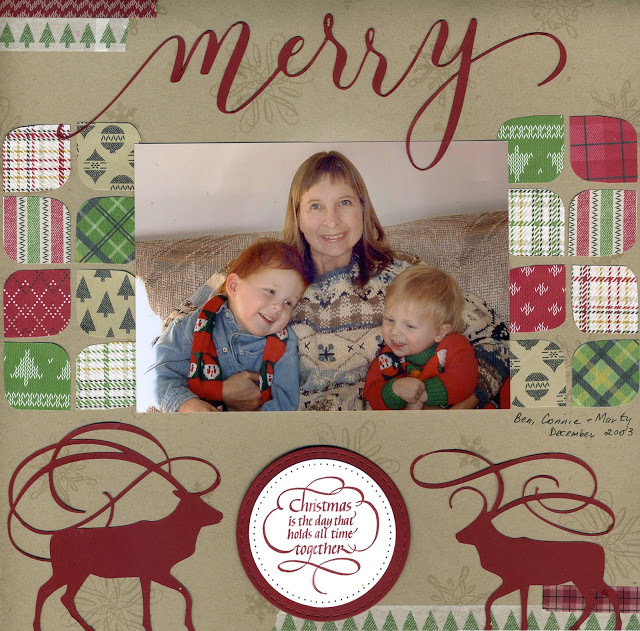 I want to wish you a very Merry Christmas. Other Products used from Elizabeth Craft Designs include: Garden Notes Poinsettia, Whitepine Boughs & Pinecone, Holiday Garland 2, Circle Background, Silk Microfine Glitter - Silver, Clear Double Sided Adhesive. 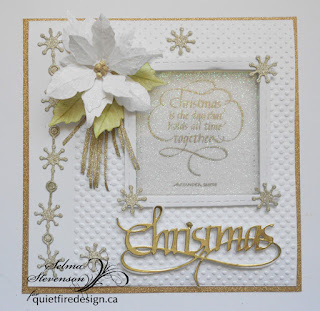 Yvonne here with a card using the Quietfire Design stampset "Let it Snow Flourished Snowflakes". 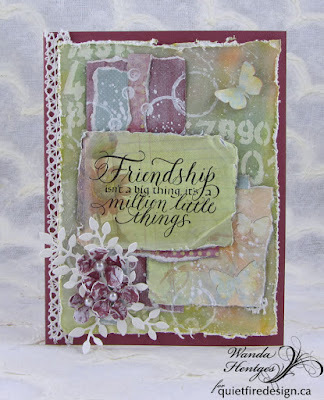 It took just this gorgeous set of stamps to make the card...no patterned paper, no die-templates! It's so simple to make your own patterned paper. 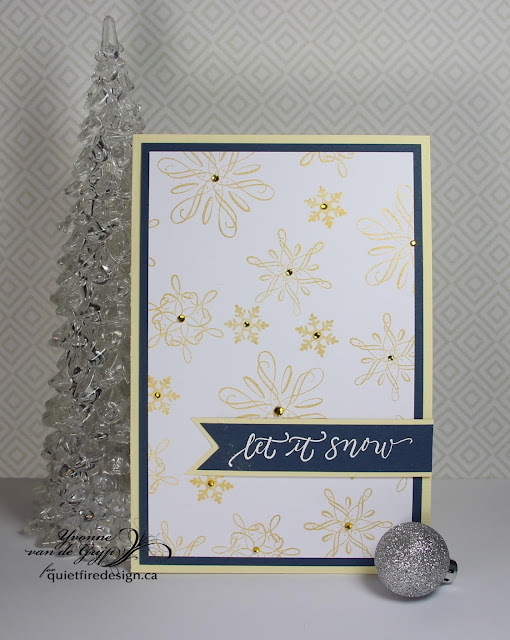 Stamp the snowfalkes of the stampset upon white cardstock using a gold (metallic) inkpad. 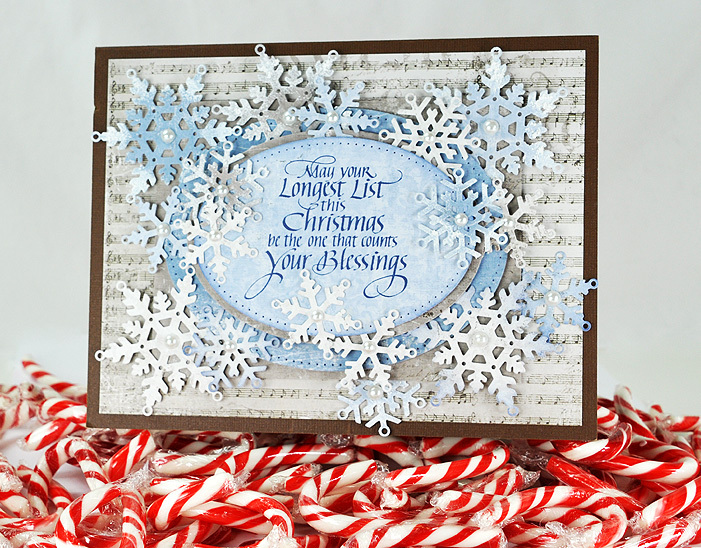 Cut the snowflake patterned paper you just made to a rectangle and mat upon dark blue cardstock. 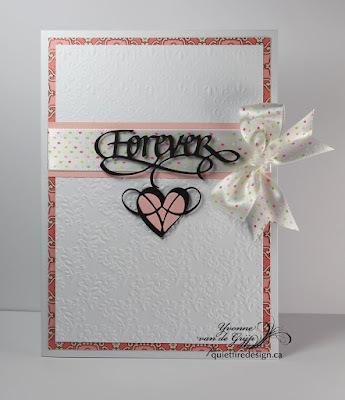 Glue upon a cream card base. 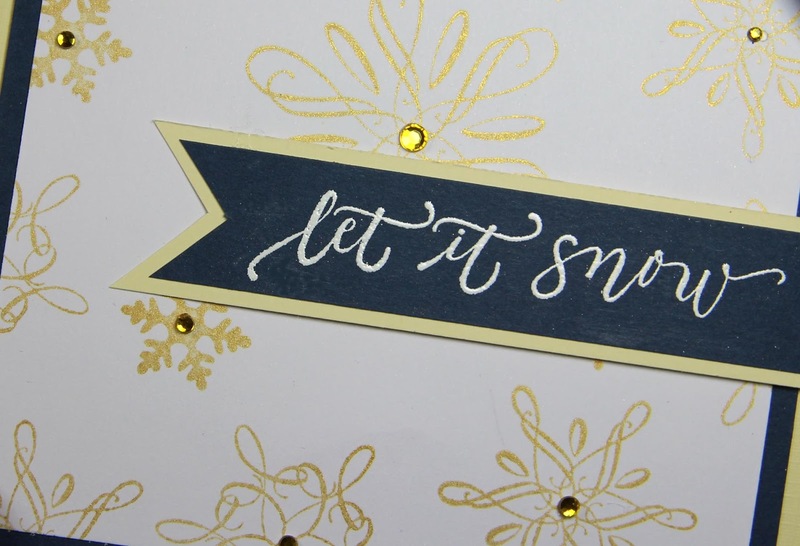 Stamp the sentiment upon dark blue cardstock using an embossing inkpad. 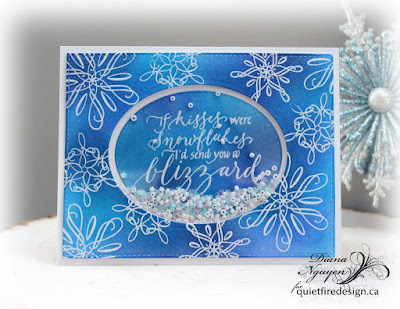 Sprinkle some white embossing powder upon and heat using a heat tool. (tip: you can also use a white inkpad if you do not have a heat tool). 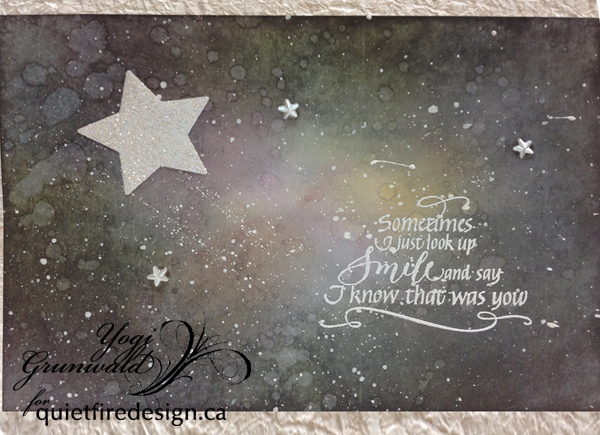 Cut a banner from the stamped cardstock and mat using cream cardstock. Glue the banner onto the cadbase using 3D foam tape. finish the card with some gold colored rhinestones. Scored, and folded my dark green textured cardstock to create the easel. 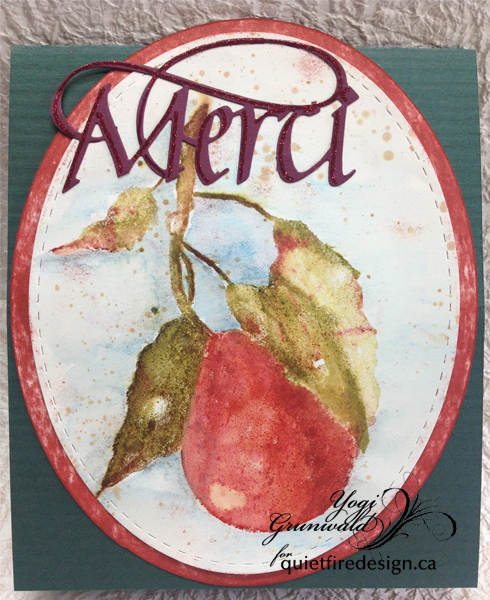 Created the watercolor pear (Penny Black) using my Misti and Distress mini pads, misting with water and stamping on 90#HP Arches watercolor paper.. Repeating the process till I got the intensity of color I wanted, then used a moist paint brush to move some of the color. Used a Derwent watercolor pencil for the background blue color, then moved it with a very wet brush. Dried, then splattered with some brownish color. 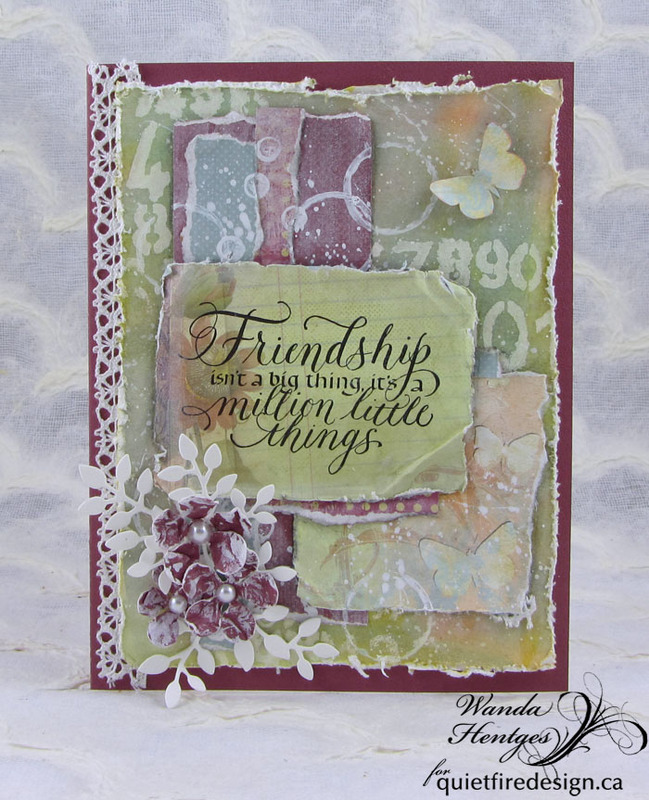 Die cut with Elizabeth Craft Designs "Stitched Ovals" set. Created a larger oval of the die and cut with my electronic cutter. Colored with a red Distress pad, adhered both layers together then onto the front. Die cut the "Merci" from a burgundy colored cardstock (Dreamweaver packaging material...) Adhered to front. Used a Quickie Glue pen and added decorative line detail, then sprinkled with Ritz micro fine glitter "Regal Red". 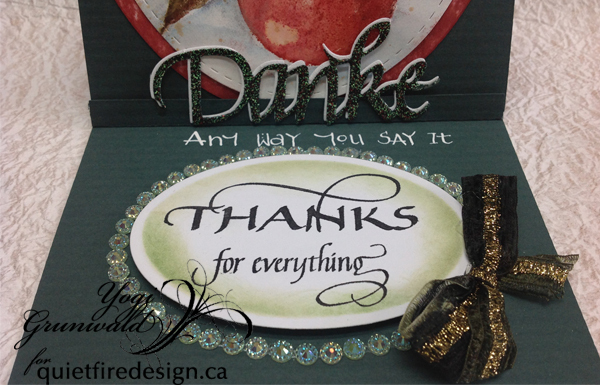 On the Floor: Die cut the "Danke" from a green and a white cardstock. 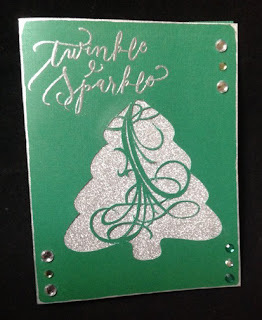 Inked the green one with Versamark and embossed with Emerald Creek "Yuletide" embossing powder. Adhered off set to the white layer. Adhered it by the bottom edge to a narrow piece of the green cardstock, scored down the center and adhered one edge tot he floor to act as my stopper. Wrote in the words "Any way you say it" with a pointed pen and my diluted Copic White Opaque ink in my funky monoline style. Stamped the sentiment on white cardstock using Versafine Black Onyx and clear embossing. 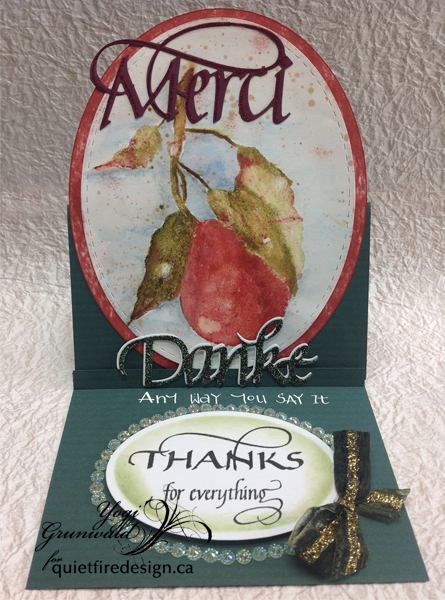 Die cut with Spellbinders oval die set, sponged edges with a dirty green sponge and adhered to floor with 3D foam tape. As a final touch, added a row of pale green gems (Dollorama) around the oval and a dark green/gold Sari bow.